We are White In Revery and this is our Masterclass for Wedding Film Editing in Final Cut Pro X. READY TO TAKE YOUR WEDDING FILM EDITS TO THE NEXT LEVEL? We are White in Revery, a wedding filmmaking company based in Denver, Colorado. After years of teaching other filmmakers all over the world, diving deep into other editing programs and continually finding FCPX to have a faster workflow, and even becoming certified to teach FCPX, we’ve created a course that unloads all the knowledge we have about this program that makes it so efficient for wedding film editors. Throughout this course, you will learn how to edit your wedding films like we do. We have created a custom workflow that has drastically improved our efficiency, speed, and creative vision for editing wedding films. If you want to learn everything we know about editing and creating captivating and emotional wedding films, then THIS CLASS IS FOR YOU! 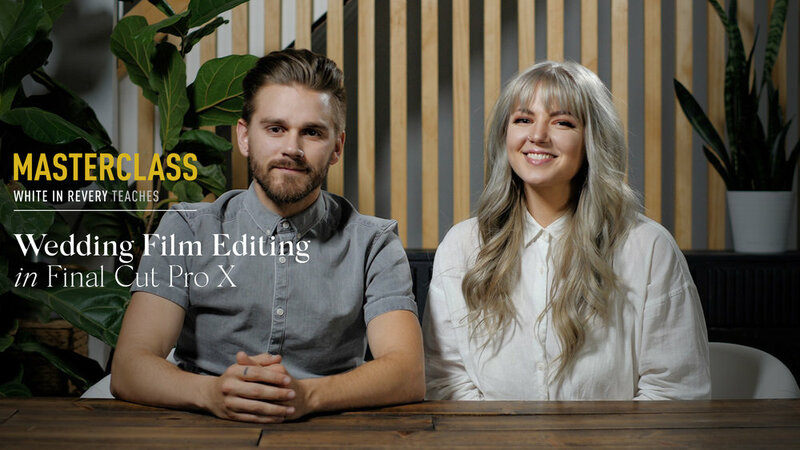 "This is OUR Masterclass for Wedding Film Editing in Final Cut Pro X"
In this course, you will learn everything you need to know about editing in FCPX. Whether you are starting fresh and learning to edit for the first time, are coming from another editing platform like Premiere, or you have been using FCPX for years and want to dive deeper and speed up your workflow, this course will get you up and running in no time. We will show you all our tips and techniques on how we edit fast, how we craft our wedding films from scratch, our entire color grading process, as well as how we clean up audio and mix it into our films. We also showcase other fun but helpful techniques like how we approach music. We all know that song choice can make or break a film, but sometimes not knowing how to edit in a song can make or break a film too. We show you how to do things like mixing songs that are in different keys and reshaping a song so that you can bring your films to life with music. We cover how we setup all of our keyword collections for quick navigation so that you can speed up your editing time and also we’ll probably blow your mind with FCPX's Multicam feature that can be used not only for syncing clips and editing, but also color grading and mixing audio quickly. You get it all in this course – everything we know about creating beautiful and emotionally captivating wedding films. This course is for you... if? that you will have access to immediately when you purchase. You will be able to create a login and access the video content that is all hosted on teachery.co immediately upon receipt. There will also be corresponding course resources to help you along your way throughout the class. After spending four years in film school, I can honestly say that the WIR Masterclass is an absolute STEAL that is loaded with incredible information. I’ve learned more about sound and color from this course than I did during all of my years in school! Having been an editor in FCPX since its release in 2011, I was pleasantly surprised to be learning lots of new tips and tricks within the program. This course is beneficial for even the most experienced filmmakers! White in Revery’s FCPX Masterclass was worth every penny! I can’t believe how in depth they went into every detail and secret of theirs. They literally held nothing back. It has greatly improved my editing time, my color grading process, my export settings, and my overall organization. In my honest opinion, whether you’re new to FCPX or not, this Masterclass will benefit you ten fold. I feel like it has been taking me from novice to pro with every video I watch. A true gem for wedding filmmakers or any type of filmmaker. After wasting money on other videos, and wasting time on youtube, this course is by far THE BEST RESOURCE out there covering this content. When I was looking onto if I was going to buy this class or not, I went to the reviews. The course was a bit expensive and I wanted to make sure that if i invested that type of money that it was well worth it. And let me say, it absolutely is! I am only on lesson 7 and it has been a blessing. I don't use FCPX for music videos, home videos or anything else – I use it for weddings, and that is what i was looking for. How can I use it for exactly what I need it for? This class has answered that for me. This course has been an excellent resource for organisation and workflow when editing. The things I’ve learned through it (from quick key shortcuts, to sorting footage and sweetening up audio) have been life-changing! My workflow has dramatically increased in the short time I’ve been in this class. Editing has always been where I feel the least confident when it comes to wedding filmmaking. I've spent years working through different youtube tutorials over different subjects and piecing them together the best I can. I am absolutely loving this Masterclass. It's concise, thorough, and well presented. I've gone through half of the lessons and have learned so much and already have gained more confidence in my wedding film editing. I highly recommend this class to anyone who is looking to speed up their workflow, become more proficient in FCPX, and gain confidence in their edit. Thanks Calen and Kristine! The WIR master class is a step-by-step guide that I have used to transform the quality of my wedding films. The class has saved me years of trial and error, also, the multicam lessons have been SO valuable. We will be going over our entire workflow from Import to delivery. The Transfer stage is your first step for setting yourself up for a fast and effective workflow. The most time consuming and the most time SAVING stage is the Prep Stage. It involves the most steps but drastically reduces your editing time if you can master this stage and put in the extra time. This section of the class will showcase how we properly set up our libraries, import our clips and add corresponding meta data, sort our footage into our template based keyword collections, and setup our multicams. Then the fun part begins - editing! Actually, the fun part for Calen was the prep stage and Kristine loves the editing stage. Since we put in the time to prepare all of our clips, the Editor can now focus on the best parts of the wedding and start pulling out the different dialogue sections and browsing for songs. When working in the magnetic timeline, there are multiple ways of crafting an edit. We choose to use the magnetic timeline by placing all of our dialogue clips such as ceremony and toasts into the primary storyline and then placing our other sequenced shots or b-roll footage above the magnetic timeline into what is called a connected storyline. We cut up our music a lot and layer multiple sections together at times, so this structure has been the easiest and most efficient way for us to edit. After the film has been exported, we then move onto the Delivery stage. Now every company has different deliverables and ways they choose to send their films off to their clients. As of 2018, we now deliver all of our films through digital delivery via Mediazilla. If you haven’t heard of Mediazilla, check out the link in our description. It makes life so much easier and simpler for us. Now there are still package upgrades we offer that do require shipping out a physical product, but we are just going to address our online delivery setup. *For those that purchase the course, also receive special deals and discounts from these amazing Sponsors! We love utilizing their products for our films, and we hope you will too. All sales are final. While we are here to help if you are having any issues, we do not offer refunds or exchanges.